Apoptosis. 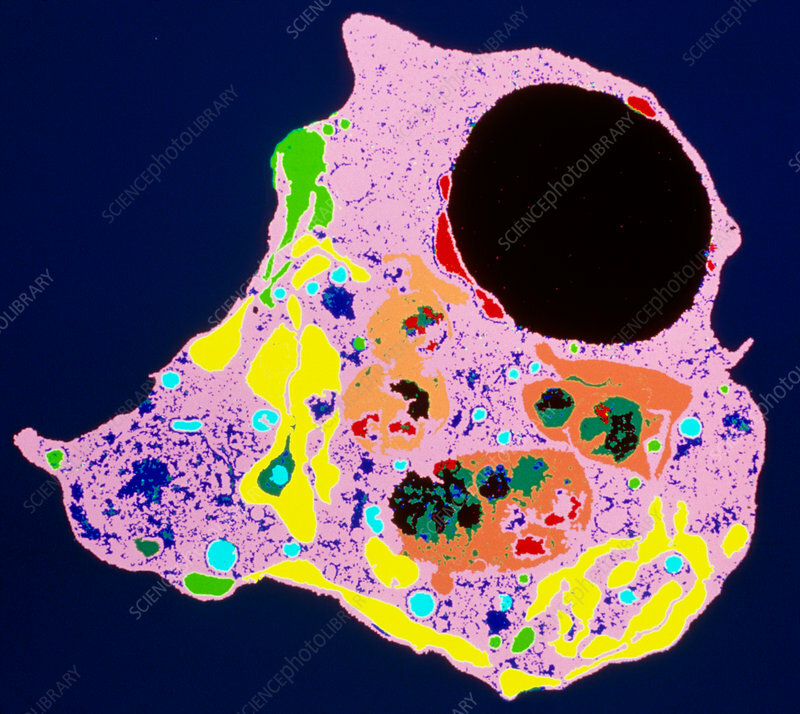 Coloured transmission electron micrograph (TEM) of a human white blood cell (leucocyte) undergoing apoptosis. This is the process of "genetically programmed cell death". Apoptotic cells change shape, and here the nucleus has broken down almost completely (black, upper right). Other organelles in the cytoplasm (pink) have become mis-shapen. This white blood cell is a myeloid leucocyte, originating from bone marrow. Cells of the human myeloid cell line undergo apoptosis if they are deprived of growth factors. Research on apoptosis may provide genetic treatments for diseases such as cancer. Magnification: x4000 at 35mm size.